Omaha, NE – On Wednesday, October 10, 2018, the U.S. Department of Homeland Security (DHS) released the public charge proposal in the Federal Register, with the opportunity for the public to submit comments by December 10, 2018. Cash assistance programs such as Supplemental Security Income (SSI), Temporary Assistance for Needy Families (TANF) and comparable state or local programs. The administration’s public charge proposal to change this policy by substantially expanding the forms of public assistance benefits and programs when determining a “public charge” definition for an individual. This would make it more difficult for immigrants to maintain or obtain legal permanent residence in the U.S.
For over a century, the U.S. government has recognized that assistance programs for nutrition, health care, and housing empower families. A few decades ago, the government clarified that immigrants and their families can seek these benefits without fear that it will harm their immigration cases. If this rule is finalized, we can no longer assure this. ILC’s Immigrant-focused Medical Legal Partnership program helps immigrants who are eligible for immigration relief. Our partnerships with local hospitals and health centers connect low-income immigrant clients with legal options that improve their access to traditional health care. This infographic is a report on our work with One World Community Health Center. Stand with immigrants and their families by submitting a comment. The current public charge policy remains unchanged until public commenting is collected and reviewed. This will take several months until the final rule is published. 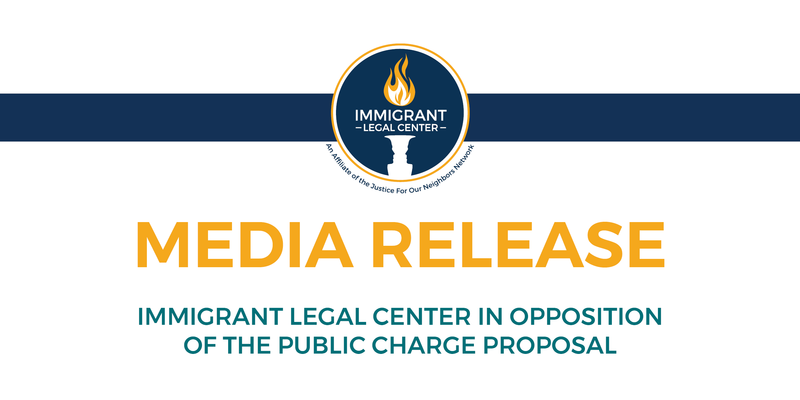 Immigrant Legal Center encourages all our supporters and partners to submit a comment in opposition of this proposal. Your comment impacts the government’s decision making and shows how many people care about our immigrant neighbors. You will be directed to next page to submit your information and comment. Below are samples of comments you can personalize. I strongly OPPOSE the Department of Homeland Security’s public charge proposal. Our lives in this country are defined by how we contribute to our communities, not how much money we make. This policy would put the wealthy ahead of families who have been waiting for many years to obtain their green card. Public assistance programs for nutrition, healthcare, and housing empowers families. These benefits foster for a healthy lifestyle for immigrants and their children. If this policy is finalized, immigrants would be afraid to seek access to meet their basic needs. We are welcoming community to all people. Immigrants should not have to choose between keeping their families together and meeting their basic needs. If it moves forward, the regulation will have ripple effects on the health, development, and economic outcomes of generations to come. The Trump Administration should immediately withdraw its proposal. Immigrant Legal Center (formerly Justice For Our Neighbors-Nebraska), is a nonprofit immigration legal services agency that provides free, professional legal consultation, clinics and court representation to immigrants who have incomes at or below 150% of the federal poverty level. The Omaha-based Immigrant Legal Center (ILC)—founded as JFON-NE in 1999—remains an affiliate of the Justice For Our Neighbors Network of 16 Sites offering more than 40 legal clinics for immigration services across the country.